Day 2 of the road trip has been a rest day. We spent the first day driving from home in New Orleans to our friend Robyn’s house in Knoxville. Robyn, Tori and jb at the quarry. So instead of doing the drive to Hampton in one burst, we made plans to take Thursday off. And it’s been a very nice, restful day, enjoying Robyn’s incredible yard (She’s been in this house about a year, and already has it certified as an urban wildlife refuge.) We took her on an errand, where she traded a container of worm castings (she grows worms in her garage) for burlap sacks from a coffee roaster, and made arrangements with him to pick up a couple of buckets of coffee grounds for – whatever it is she uses them for. We also went out and saw a couple of historic sites, the quarry where a lot of the marble in federal, state and municipal buildings across the country was mined – apparently Knoxville was once known as “The Marble City.” Who knew, outside of Knoxville? John and three-pound rifled ordinance. Then up to Fort Dickerson, the site of a Civil War battle in which Union Forces slammed the back door to Knoxville on a superior Confederate force. It was interesting, and always a little awe inspiring to think about what had taken place on that spot 150 years ago, men not much different than myself engaged in a life and death struggle – literally – for the soul of a country. We’ll be off at the crack of dawn tomorrow, heading for Hampton, Virginia, for the Blackbeard Pirate Festival. Looking forward to the Pirates’ Ball Friday night, where we’ll get to hobnob with Hampton’s finest freebooters. 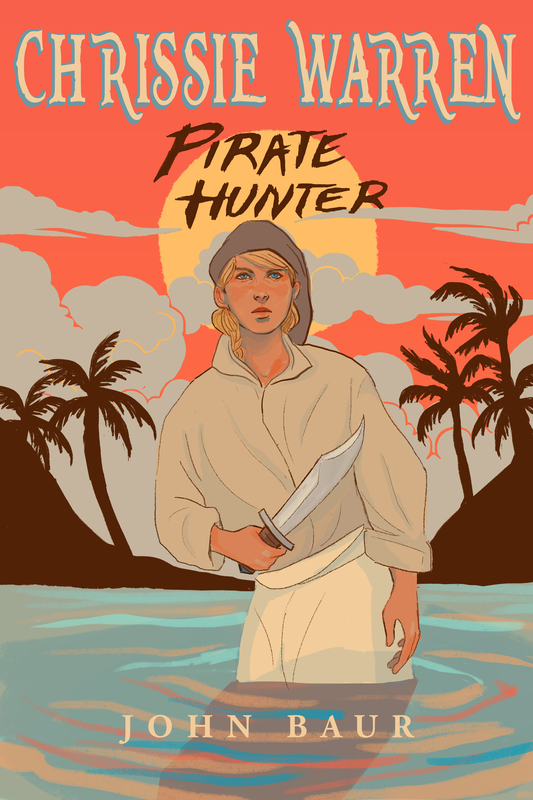 And we’ll be doing our best to sell “Chrissie Warren” Pirate Hunter,” while we’re there. After all, it was not an accident or coincidence that the opening chapters of the story take place in Hampton. I knew I’d be there soon. Tori knows what the big guns are for – Looking dramatic! The trailers are often the best part of a night at the movies. And more and more books are getting the same treatment, a minute to two-minute video trying to entice people into reading. I decided to put one together for Chrissie. Video software is ubiquitous and fairly easy to learn – although like so many things, it’s easy to learn but takes a lot more time to master. But Tori and I have done a lot of videos for the Pirate Guys, so we figured why not. It took a lot of time, one of the reasons I haven’t posted in a couple of weeks. I was mostly slowed because Apple keeps “improving” iMovie, in particular, the text functions, which slowed me down a lot. It was maddening. But I roughed it out, then Tori cleaned it up. After you ooh and ahh over mine (kidding there,) you should go to youtube and search the words “book trailer.” you’ll be amazed how many come up. They range in quality and resources from full-blown productions with actors and budgets (I suspect these are paid for by publishers who only throw money promoting products they already think will be best sellers,) to videos of authors sitting on front of their computers camera talking about the book. Mine falls in the low-budget category. The music, which wasn’t what I was looking for but was perfect, came up on a search for “non-royalty tin whistle music.” The images were all sketches done by my cover illustrator. The words were from fans who loved the book. We all know the story. When you self-publish, you’re not just the author. You have to do everything, and while that can be onerous, it also gives you a certain freedom. You can be a director, creating your very own video for the trailer. It was more work than I expected. It’s easy to rough out. Harder to clean it up so that it looks good. But I had fun, probably too much.